CloudCaster is my tool to cast clouds into existence in many regions, yet still maintain source-controlled infrastructure specifications. A single JSON document is used to specify your cloud architecture. Currently it only supports EC2/VPC/Route53. This tool is my attempt to capture all the manual steps I was using to create Virtual Private Cloud infrastructure: subnets, routing tables, internet gateways, VPNs, NAT instances, AutoScale groups, launch configs, and Load Balancers. In each Availability Zone, it creates a Public subnet and a Private subnet. The public subnet will contain any ELB’s created, apps specified with the “public” flag, and the NAT instance for the private instances to reach the world. I wrote this tool for a number of reasons. I needed a way to specify the state my cloud infrastructure should be in, and be able to re-create the infrastructure setup in case of a catastrophic failure. Eventually I will need to transition to multi-cloud, and specifying the infrastructure will allow me to adapt other cloud provider APIs when I need them without being locked into a single vendor. I also wanted to codify many of the best-practices I’ve learned into the automation, so new services are created default-best. Naming is partially-enforced. Load balancers and AutoScale groups have the environment name postfixed to the name. Security groups do not (least surprise!). The concept of a “continent” is just a DNS grouping to allow for delegation to a Global Traffic Manager or second DNS provider. Warnings apply – CloudCaster will create instances and load balancers, and that will cost you money. There is no delete option, you will have to manually delete all resources created. It is not designed to be a general purpose tool for all your needs – it does exactly what I need, and a little less. In the example.json, you may notice mention of a “psk” – this is for a future post where I will talk about creating automatic VPNs between VPCs using a VPN concentrator instance and the NAT instances. 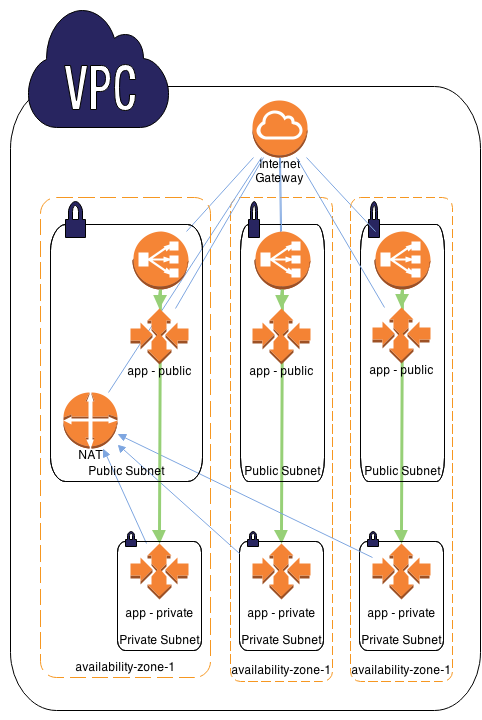 For now, you will see that CloudCaster sets route in the public subnets for “privnet” – the overarching private subnet for all your worldwide VPCs. This entry was posted in Uncategorized and tagged aws, Cloud infrastructure, ec2, infrastructure, load balancers, vpc on January 6, 2014 by WrathOfChris. Each new year, I have looked back upon the previous and ahead to the future. After many hard lessons in the past, the future has been increasingly brighter. The last 5 years have taken me sailing and flying around the globe to more than 50 countries, making friends home and abroad, creating a home in Vancouver, meeting an amazing woman, and working with people who value me. In the last year, I’ve realized that I need to stand my ground and say ‘no’ when the impossible is asked of me. Heroics cannot be considered normal, nor expected routinely. In the last 6 months, I’ve realized that I cannot give less than my all. I can either effect change and push for improvement, or remove myself from the situation. In the last 3 months, I’ve realized that I enjoy working with people I value and respect, and who also value and respect me. This new year will challenge me in ways I cannot even yet fathom. This entry was posted in Uncategorized on January 1, 2014 by WrathOfChris. Each and every day I find myself needing lists of host groups within EC2. Lately it has been for building clusters of distributed Erlang and Riak, but also for adding dynamic or periodically updated lists for monitoring. Great! So much easier, but I’m already on a host that is tagged, why does my config management system have to inject that info? Lets make it autodiscover based on the instance metadata. This requires an instance-profile role with permissions for “ec2:Describe*”. Here we can be verbose and see the discovery values. Perfect! Now we have automatically discovered peers without our (env,service,cluster) group. This entry was posted in Uncategorized and tagged boto, devops, ec2, ops, python on December 14, 2013 by WrathOfChris. Stopped in Yoho national park recently, and managed to catch a train passing through the lower spiral tunnel heading uphill. About halfway through the video you’ll see me surprised by the loopback, and zooming out to catch the same train coming back across the near side of the valley. This entry was posted in Uncategorized and tagged spiral tunnel, train, yoho on September 21, 2013 by WrathOfChris. Want to see something terribly old from my past? This is “Chopstix” a restaurant order entry and management system. It puts the curse in libcurses, and shows why dot matrix printers are both fantastic (run forever) and awful (vendor specific control codes). It also taught me a lot about user experience, designing for stability and extensibility. I’m releasing it as-is – it was last built against OpenBSD 4.2 which is long since deprecated. Great reading on security principles for system design. 70+ simple statements to ponder when designing systems. Blog post I wrote for code.hootsuite.com on how we moved the Ow.ly server infrastructure from coast to coast.